One thing that concerns me when I paint or repair something is addressing the reason it failed before, provided it wasn't simply aging materials. In the case of the facia boards on this wood caboose, I think they were smashed because of impact with tree branches. The facia borads would crack, that allowed water past the paint layer, and the smashed wood absorbed and held water. I really wanted to prevent that from happening agin, so I came up with the following idea; the hardware, like handrails and ladders, would no longer be bolted to the facia board. Now, a steel pipe insert would send the impact back to the big angle iron piece behind each facia board. In the picture above, there's a 1/2 inch drill with a hole saw setting on the roof, along with one of the inserts. Below the drill, on the facia board, is one of the inserts protruding from a hole. This distance will allow for the trim that holds the edge of the rubber roof on the facia board. The rubber sheet folds down over the corner and onto the facia board. In the picture above, you can see the jig I made for places that already had bolt holes. Those bolt holes are too big for the small bit that guides the hole saw, so this 1 X 4 is an easy to make guide for the outside of the hole saw. 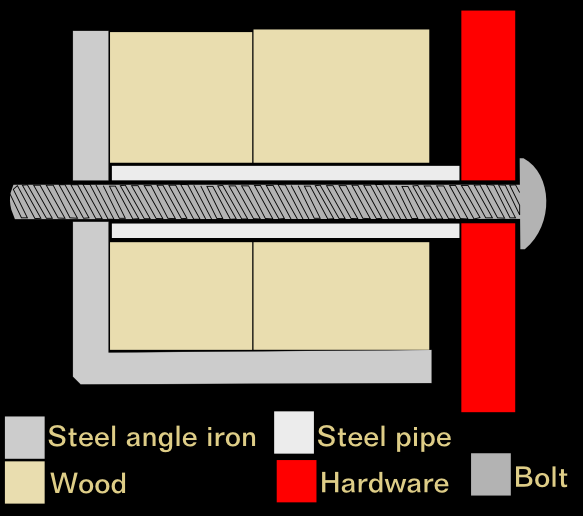 This diagram should explain the location of the pipe inserts if I didn't describe it well enough above.